Peet's Coffee & Tea opened Aug. 18 in the former Jazzman's space on level 1 of the Robert W. Woodruff Library. Photo courtesy Robert W. Woodruff Library, Emory University. San Francisco-based Peet's Coffee & Tea opened Aug. 18 in the former Jazzman's space on the first floor of Emory University's Robert W. Woodruff Library. The menu includes Peet's signature coffees and teas, as well as bakery goods from Atlanta's own Highland Bakery, similar to those offered at the Goizueta Business School location. 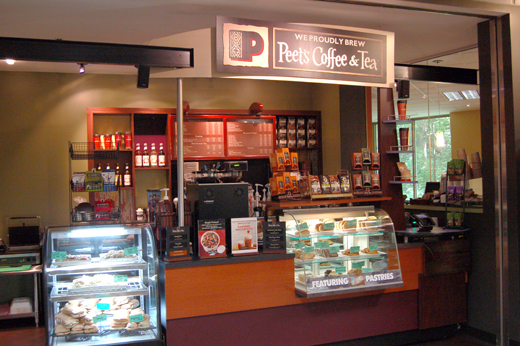 Peet's library location is operated and staffed by Sodexo, Emory's food service vendor. Salads and panini sandwiches are also available. "We're installing two commercial-grade panini presses," said David Furhman, University Food Service Administration senior director, a week before the opening. "It really will be a nice variety of food offerings." Grab-and-go sandwiches, beverages and snacks are available as well. The dining area has been remodeled, but the vintage-Emory photo-topped tables have been retained as a nod to the university's history and the library's collections. A counter-height table with seating has been installed near the vending machines. In the sitting area, the chairs have been reupholstered. The changeover from Jazzman's to Peet's is the result of user feedback, said Charles Forrest, Emory Libraries facilities director. "This was a recurring theme in the last few student surveys conducted by the library," he said. "Students were asking for better food and drink options." Peet's hours for the week of Aug. 18 are Monday-Friday, 8 a.m.-2 p.m. During the week of Aug. 25, hours will be Monday and Tuesday, 8 a.m.-2 p.m.; Wednesday-Friday, 7 a.m.-7 p.m.
Fall semester hours for Peet's beginning Sept. 2 will be Monday-Thursday, 7 a.m.-1 a.m.; Friday, 7 a.m.-10 p.m.; Saturday, 11 a.m.-10 p.m., and Sunday, 1 p.m.-1 a.m., but are subject to change. The Emory location is the first Peet's in Atlanta, and the first in the southeastern U.S. However, several area Kroger, Publix, Target and Wal-Mart stores carry Peet's packaged coffee.